The development of the scenarios was preceded by an extensive project. Consultancy firm, Van De Bunt Adviseurs collected inputs from 150 participants during ten interactive sessions. A brief explanation of the methodology. It is not possible to make an accurate prediction of the future. Simply extrapolating current trends and future developments will, by definition, result in incorrect predictions. Scenario planning offers an alternative methodology because it explores a number of hypothetical situations in the future. By assessing trends, the context in which the sector may be operating in 2025 can become clear. The scenarios provide a broad brush outline of the "edges of the playing field". Scenario studies always provide multiple images of the future. The images produced help to stretch and prepare people's imagination for any potential surprises in the future. Scenarios may be confrontational, but they always offer inspiration and new insights. This is how this form of research can create the starting point for informed discussion about opportunities, threats, options and risks for Dutch journalism. The research uses the scenario methodology developed by Shell and Global Business Network. A total of 150 participants, from inside and outside the sector, were gathered together during ten sessions that were designed to collect input for the scenarios. Public news agencies and broadcasters from the Netherlands, such as NOS, RTL Nieuws, industry association NDP Nieuwsmedia, journalists union and the Journalism Fund, worked together in a steering committee to oversee the research process. 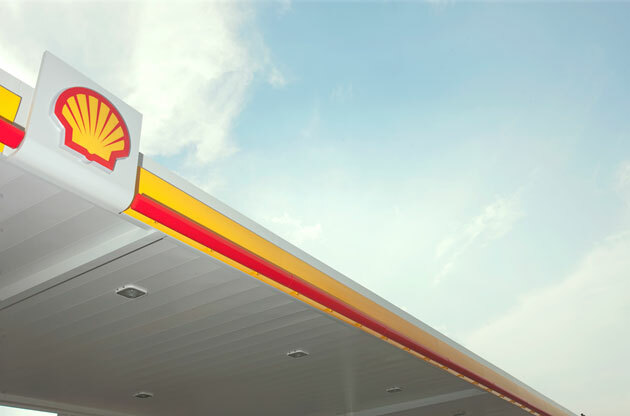 The multinational company, Shell, has been making use of scenario planning to shape corporate strategy for decades. Harvard Business Review describes how scenario planning helps the company cope with an uncertain future. The first step in the process was to identify the most important questions concerning the future of journalism. What are the future questions that editors, trade unions, journalists and policy makers need an answer to? This 'meeting about the big questions' was followed up by an indexation of all the relevant developments. What are the (potential) trends at a social, technological, economic, ecological and political level that may affect the journalistic landscape in 2025? These trends vary between increased video streaming bandwidth, to a reduction in the confidence that the public has in its government, both of which may have implications for the future of public broadcasting. These trends were brought up with experts from inside and outside the sector during 'trend meetings'. The huge list of suggested trends were categorised and divided into certain trends, upon which all participants were in agreement, and uncertain trends, which led to a discussion about whether they may or may not occur. Certain trends should, of course, be referred to in any scenario. Uncertain trends may or may not occur and as such, can be used to add colour and form to different scenarios. There a two uncertainties that are considered to be the most important: The first uncertainty is the extent to which we will embrace technology in the future. It is clear that technology will evolve, but how quickly? And how far will we go along? Will new technology be eagerly used or will we be reluctant to use it? The second uncertainty concerns the level of trust in institutions. Around the world, governments and companies are coming under increasing pressure due to the changing demands of critical citizens and empowered consumers. This, for example, will result in people being able to organise their own insurance or energy generation. If these trends were to continue, it may result in a do-it-yourself society where citizens organise themselves or each another as much as possible. But it is also possible that the confidence of citizens may be re-won and large organisations continue to play an important role in society. These two uncertainties are diametrically opposed and are placed on opposite axes in a coordinate system, whereby the poles are the extremes. This leaves you with a horizontal axis whose left section measures the extent of low social trust in institutions (a do-it-yourself society) and a right section that measures the extent of high social trust in institutions (a company will do it for me). Technological uncertainty forms the vertical axis, with the lower section showing the level of low acceptance and development of new technology (reluctance) and the upper section showing high acceptance and development of new technology (radical). Two uncertainties: 'social trust' and 'acceptance of technology', are the two axes that form the basis of the four scenarios. The four quadrants of these axes form the context of the scenarios. 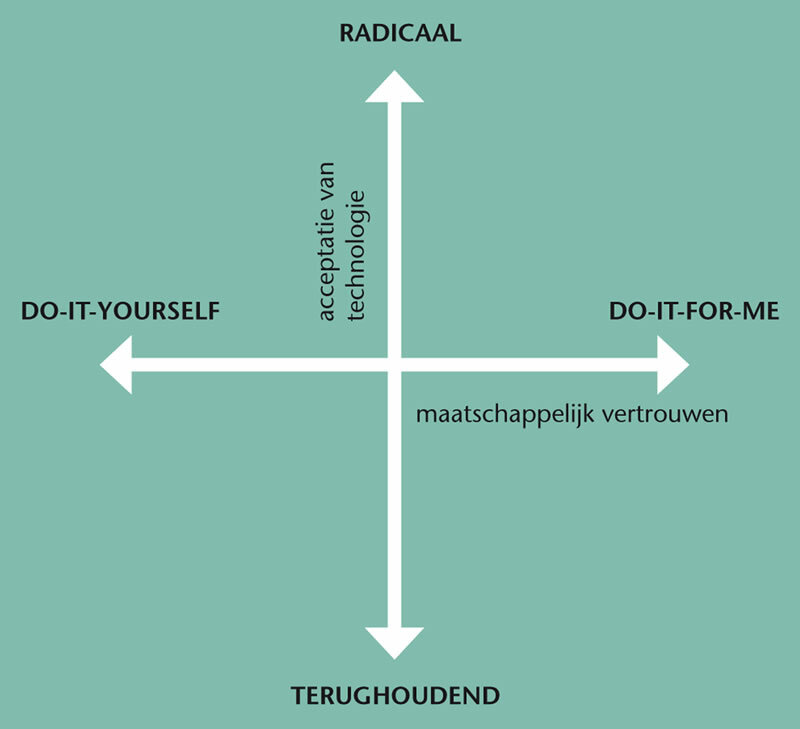 For example, the top left quadrant of the coordinate system shows a highly developed technological society with low trust in institutions (radical + do it yourself), and underneath this, a society that is reluctant to make use of the technology but has rather a lot of trust in institutions (reluctance + do it for me). The scenarios are then completed by considering the implications of the trends and the uncertainties: What if we develop ourselves into a society in which we, as citizens, organise ourselves using the latest technology? What will be the impact? What does that mean for journalism? This is how the scenarios are given form. In addition to the four scenarios, tools have also been developed to provide support to anybody who wishes to work with the scenarios. The toolkit provides the basis for a workshop in which participants are encouraged to think about the consequences of the different scenarios for their organisation.